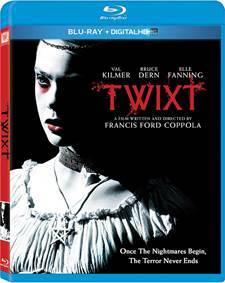 TWIXT follows Hall Baltimore (Kilmer), a writer on a book tour who uncovers a disturbing murder that could be source material for his next novel. But as Hall investigates the killing, he finds himself confronted by chilling nightmares, including the ghost of a young girl (Fanning). As he uncovers more horrifying revelations, Hall discovers that the story has more to do with his own life than he could ever have imagined. Twixt images are © 20th Century Fox. All Rights Reserved. Who'd've thought we'd see the day when the once-great Francis Ford Coppola, the director who brought us The Godfather and Apocalypse Now, would be reduced to releasing a cringe-worthy straight-to-video horror movie? Twixt was born out of a Poe-like, particularly melancholy dream the filmmaker had a few years ago after a drunken night in Istanbul, and early reports of the experimental project were intriguing. However, Twixt is awful. Embarrassingly awful. It's hard to believe one of the best directors of the '70s made this. The films of Coppola's latter-day career renaissance—Youth Without Youth and Tetro—haven't been great, but they at least feel like fully-formed works with comprehensible stories. Twixt, though, operates with a poor man's David Lynchian dream logic, and worse, it's almost indescribably tasteless. All too fittingly, Twixt is about a once-lauded novelist who's now regarded as less than a hack. Val Kilmer plays Hall Baltimore, a "bargain- basement Stephen King" who drives into the sleepy nowheresville of Swann Valley on his latest book tour, sets up a table in the local hardware shop, and promptly garners an audience of no one. His lone sale comes from the town's cantankerous sheriff, Bobby LaGrange (Big Love's Bruce Dern), who fancies himself a writer and is keen to collaborate with Baltimore. The sheriff even has a story in mind, with a title and all—The Vampire Executions—inspired by the ongoing investigation into the murder of a teenaged girl whose body is still in the police station's morgue, impaled with a wooden stake. Baltimore agrees to assist, eager to write a book that doesn't involve witches—he's been pigeonholed as the "King of Witchcraft"—and in desperate need of an advance from his publisher in order to keep his shrew of a wife from auctioning off his first-edition, ultra-rare copy of Walt Whitman's Leaves of Grass. After the requisite research, he sets up shop in a fleabag motel, armed with his laptop, a few bottles of Irish whiskey, and several varieties of sleeping pills. See, Baltimore's modus operandi is to literally dream up the endings of his stories, and a good chunk of the film takes place—in selectively colored black and white—inside his sleeping brain. He even has a spirit guide of sorts in the ghostly figure of Edgar Allen Poe (Ben Chaplin), with whom he has unnecessarily longwinded discussions about horror storytelling, the importance of a good refrain—think "Nevermore! "— and the "most melancholy subject in the world," the death of a beautiful young girl. Intentional or unintentional, the influence of Twin Peaks here is obvious, from the wood-paneled sheriff's office and a derelict, red-curtained hotel—where a dozen children are buried beneath the floorboards—to the all-around kooky townsfolk, like the dancing repairman who's in charge of upkeep on the clock tower that looms over Swann Valley, its seven faces each showing a different time. Coppola strings events and oddities and details together in a way that means to suggest a disjointed Lynchian narrative, but he just doesn't have Lynch's intuition for the haunting and surreal. The story, such as it is, involves a deranged minister (Anthony Fusco), a tribe of goths who party hard in a makeshift Burning Man across the river—led by the Baudelaire-quoting, Harley-riding "Flamingo" (Alden Ehrenreich)—and a spectral 12-year-old named "V" (Elle Fanning), who stands up to one evil and succumbs to another. V appears to Baltimore in his first dream, and becomes a kind of surrogate for his own daughter, who died years before in a tragic boating accident. None of this flows together well, and if there's one thing a film that relies heavily on dream logic needs, it's a good flow. The sad reality is that Twixt is top-to-bottom bad. The script is leaden with clunky dialogue. The tone is weirdly inconsistent, sometimes straining for a fairytale nightmare vibe and elsewhere going hokey with small-town comedy. Then there's Val Kilmer, looking like an overfed lion and absolutely joyless to watch. It's hard to even be specific, because everything about the film seems off. Nothing sticks to the wall, so to speak, and what we're left with is a soppy pile of bad ideas and poor stylistic choices. As a "third-rate writer of popular fiction," Hall Baltimore has trouble getting an advance on his new book, and one wonders after Twixt if Francis Ford Coppola will have similar difficulties. It's hard to judge the film's 1080p/AVC-encoded presentation by any standards other than its own. Aesthetics are highly subjective, so let's try to stick here with what you'll see in the image. Namely, lots of inconsistency. Some scenes are wicked-sharp, with easily visible fine detail in faces and clothing, while others are gauzy and soft, with noticeably indistinct textures. Likewise, some night scenes are buzzing with source noise, while others have clearly been smoothed out with some manner of digital noise reduction. We can presume that, color-wise, the film probably looks as intended so it is what it is, and the best you can say is that the Blu-ray release is definitely a truer-to-source-and-intent version of the film than the DVD. The film features a lossless DTS-HD Master Audio 5.1 surround track that's somewhere twixt "acceptable" and "excellent." That is, this is a workmanlike mix that gets the job done and rarely draws any attention to itself.